Fill a stock pot three quarters full with water. When boiling, add salt and blanch pasta, then shock in ice water. In the same stock pot, wipe dry and coat lightly with oil, sauté the garlic, ginger and onions. Sweat until soft and season, about 3 minutes. Add chicken meat and brown. Add naturally brewed soy sauce and tomatoes. Bring to a simmer and cook for 20 minutes until liquid is reduced by ¼. Check for seasoning. Add basil and spinach. 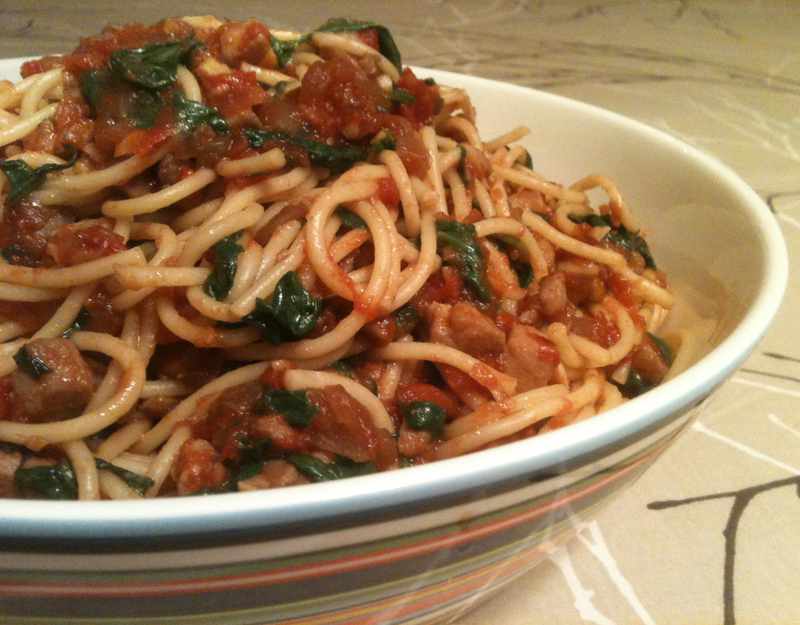 Add spaghetti to heat and serve. Garnish with cheese. Heating tomatoes such as sauteeing or stewing them in the cooking process, increases the amount of lycopene that is bioavailable; heating tomatoes at 190°F for 30 minutes increases the lycopene by ten-fold. What is the difference between dark and white meat? Dark chicken meat, such as found in the thigh and leg is made of so-called slow-twitch muscles that contain high amounts of the dark-colored protein called myoglobin that can store energy for sustained activity. In contrast, white meat such as found in chicken breast is made of fast-twitch muscles used for quick bursts of activity. Dark chicken meat contains Vitamin K2 (menaquinone), which possesses antiangiogenic activity. K2 is different from common dietary Vitamin K1 (phylloquinone) found in leafy green vegetables. K2 is made by intestinal bacteria and is present in meat, cheese, and egg yolks. In a 2006 USDA study, Vitamin K2 was found detected at much higher levels in chicken than in beef and not present in fish. Surprisingly well-written and informative for a free olnnie article.